Are you hoping to connect with the major businesses of tomorrow and the passionate start-ups of today? Download the emails, phone numbers, and addresses that come with our new business listings and market to this fresh group in a fresh, new way. Buy and download a list of new businesses when you want to reach out to some of the most enthusiastic, innovative contacts out there. Unlike veteran business-owners, those who run new businesses are often very open to innovation and suggestion. Such new companies often operate with few employees, meaning that there's often far less red tape around owners, decision-makers, and CEOs. If you want to connect with a group that's more likely to be enthusiastic about your product or service, new business leads may be the best answer for your next B2B marketing campaign. Know that you'll be talking to often open-minded, changeable, and authoritative deciders when you call, send mail to, or email leads from a new business list. You can get in touch with the right people, whether you plan to cold-call, send direct mail, or send a targeted email blast focusing exclusively on ways to help a new business. 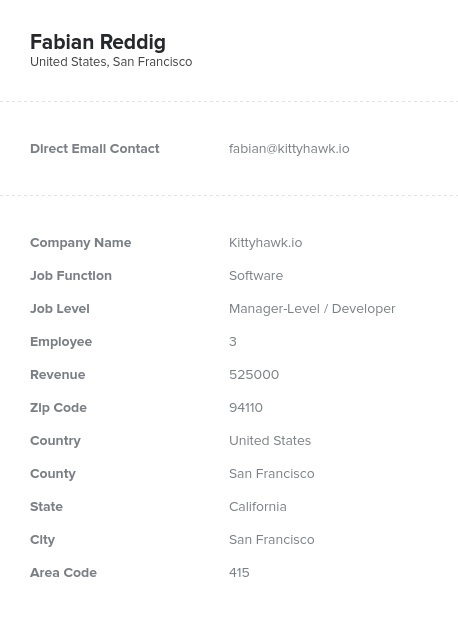 Lists from Bookyourdata.com contain all of the important contact data that you need, and our data is verified by humans, highly qualified, and, as a result, very accurate. They're also affordable, meaning that you can quickly collect new business leads that can result in real sales without investing a huge amount of money and time. We at Bookyourdata.com want to help you download a list of targeted sales leads that will make the most profound impact on your conversions, and new business lists often offer a unique approach to marketers, allowing them to gather more interest and involvement from a less-focused-on group. Our premium new business mailing list, which doubles as an email database, can breathe new life into your B2B campaign, allowing you to connect with more creative people in a more creative way. Pull new business listings with this ready-made product, or create your own email list to craft the perfect marketing solution for your business!